Fantastic news! Upgrade your SIM to a 4G SIM today and we will reward you with 5GB of FREE data INSTANTLY! Hurry up, there's little time left! What this simply means is that, MTN is giving out free 5GB of data when you upgrade your MTN sim to a 4G Sim card. Isn't that interesting? The data can be used for browsing, downloading, streaming etc. And it doesn't require any form of VPN before it can power all apps on your Android phone. As we all know that MTN has the widest network coverage in Nigeria, switching to MTN 4G should be a must if you want to enjoy the speed of LTE. MTN 4G data plans are available but this awoof data is just to welcome you to the 4G network. 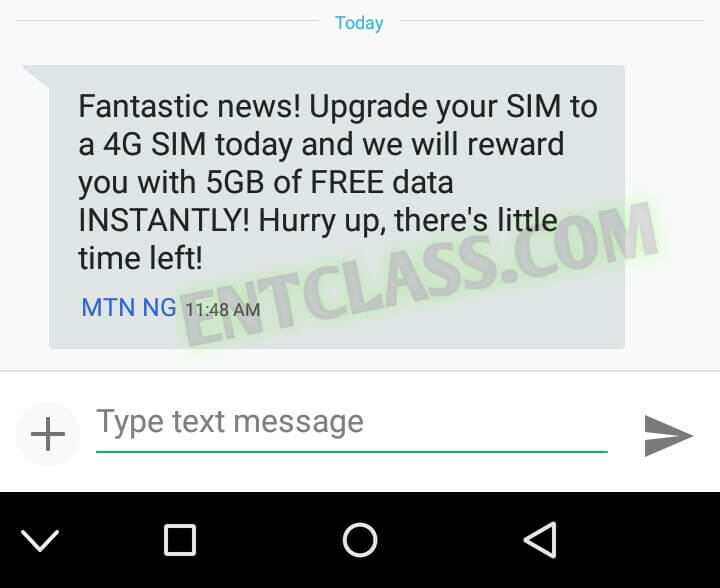 You can checkout the available MTN 4G data plans and how to subscribe for it Here. Before you can enjoy this awoof data from MTN 4G, you need a 4G LTE enabled smartphone, not just 4G enabled phone, but a 4G phone that support MTN's 4G Band. MTN 4G LTE supports band 20 (800MHz) and Band 7 (2600MHz). Almost all 4G enabled smartphone has these Bands. If you are not sure of the bands your 4G phone supports, you can Google the specs of the phone or comment your device model and i will tell you which Bands your phone supports. Alternatively, you can check it yourself on your Android phone, kindly see this post Here. Secondly, you need to swap your MTN Sim for a 4G Sim card. Kindly visit any MTN Office nearest to you. If your reply stated, "You need to upgrade your SIM card and Device to enjoy MTN 4G LTE". Then your device doesn't support MTN 4G service. But if your reply stated, "You need to upgrade your SIM card to enjoy MTN 4G LTE. Then your device has support for MTN 4G Bands. You only need to swap/upgrade your SIM. After that, go to the nearest MTN office and swap your MTN SIM to a 4G LTE SIM. Then dial *131*4# and the free 5GB data will be given to you instantly. That's all. I hope you understood all what I've written? If you are confused or have any question to ask, kindly use the comment box below and I'll reply you immediately. No. You can't even have access to the normal MTN data plans. You will only be able to subscribe for only 4G Data plans. Also, i don't think switching to 3G network will be possible. Yes, it is 4G enabled, but i can't get the Bands it support. Kindly follow my steps Here to check the bands it support. Nice one boss.. It really cool. Does this mean my device supported 4G? What model of phone do you use? Let me know.